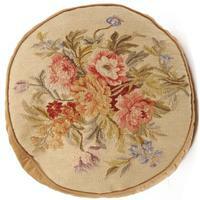 This petite Garland Round Cushion is custom made to fit these two chairs. 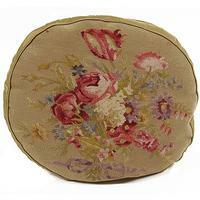 This Garland Round cushion combines soft tones of beige, pink and rose lending a very feminine look to this hand sewn Aubusson cushion. 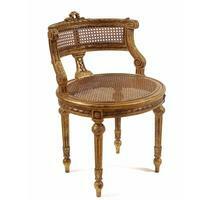 These Lisette Chairs are 18th Century reproductions, curved backs, perfectly painted stools to decorate your home. 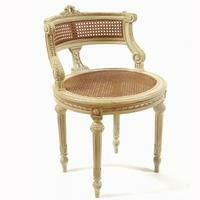 Add it to your bedroom or bathroom to go in your elegant boudoir or just a sweet chair to sit on while you are getting dressed. It's another rich colored piece to bring cozy serenity to your home. 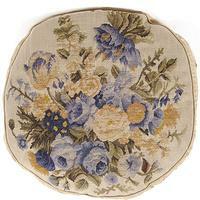 This piece certainly fits at our French Country store. Order yours today too! Note the hand-carved back and tapered legs. Note, too, the decorative richness of the hand painted finish and hand-crafted cane seat and back.